A De Dion Bouton tricycle & forecar. Homepage. This page: A fine motorised tricycle produced by the De Dion Bouton firm, and the forecar conversion. A rider and his De Dion Bouton Tricycle. Lyndon kindly sent this old photo over, it shows a smartly-dressed gent preparing to startle some pedestrians on his motor-driven De Dion Bouton Tricycle. 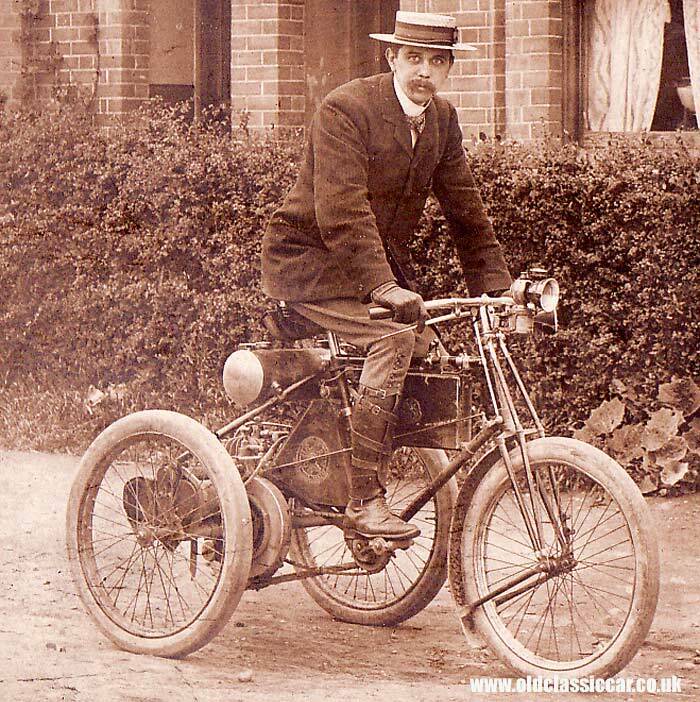 Count De Dion and Georges Bouton produced their first powered tricycle, sporting a 137cc engine, in 1895, with a 250cc version being introduced in 1896. Cars bearing the De Dion Bouton name were also produced. The fuel tank was positioned between the cyclist's knees, and the control levers just above that. 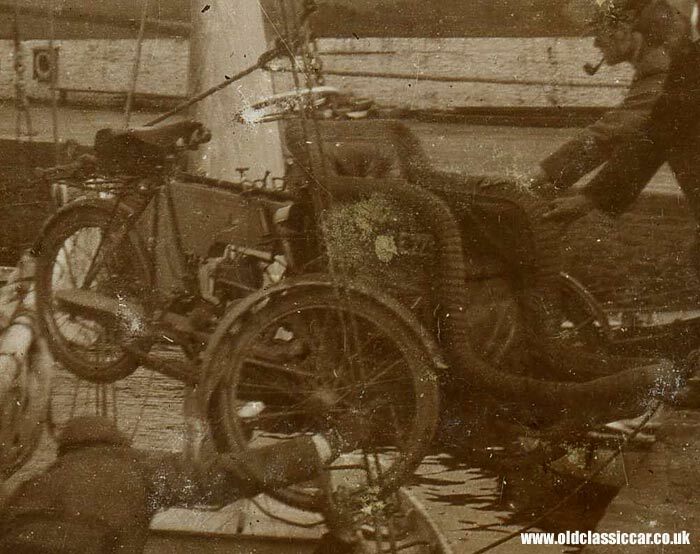 The example shown above sports an optional water-cooling kit, the cylindrical tank & radiator mounted behind the rider's seat handling this extra cooling, handy if you lived in a hilly area and needed to work the engine hard. Owners keen to accessorise their De Dion Bouton, could also opt for a handy little trailer seat, or perhaps the "forecar" attachment, turning the tricycle into a quadricycle. A part-dismantled tricycle, and probably also a De Dion Bouton, can be seen alongside some tired old motorcars on this page of the vintage photo gallery. The following old photos turned up late in 2009, and were described as featuring a De Dion Bouton Forecar. Several firms made forecars, so if someone could confirm the make of this forecar it would be appreciated. This particular machine looks a little later than the tricycle shown above, and incorporated a single rear wheel, with two up front, either side of a comfortable looking armchair. The first image shows the forecar being craned into a sailing vessel, the location is given as St Mawes Quay, Cornwall. The second shows the tricycle safely stowed on board. Shown below, a clearer look at the machine in question. Note the fitment of a steering wheel rather than handlebars. Crash protection for the passenger wasn't really a consideration in those days. Return to the classic bicycles main page.